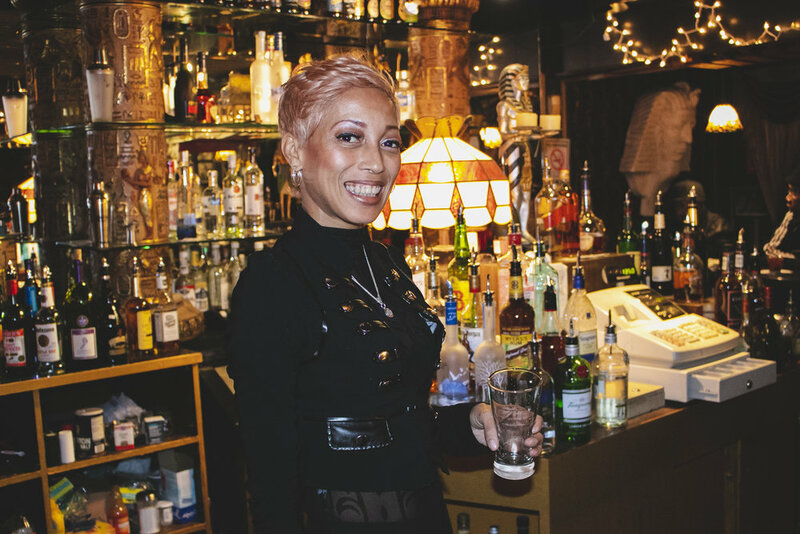 Carla Nicole Smith is a bartender and server at The Greenwich, a famous jazz club located in Walnut Hills. From becoming a ritzy destination in the industrial age to serving as a gather space during the city’s boycotts in the early 2000s, The Greenwich has withstood the test of time, and has hosted musicians and performers from all over the country. As new bars pop up around the neighborhood, one thing is for certain – this is home for a lot of patrons. Maybe it’s the birthday decorations Carla puts up for guests’ birthdays or perhaps the words of encouragement she offers to the University of Cincinnati College-Conservatory of Music (CCM) students performing. Before I left for the evening after our interview, Carla had introduced me to many of the regular customers and musicians. What did they all have to say? “Carla is the best.” We couldn’t agree more as Carla told us about her background, family, and time at The Greenwich. Interview by Liz Rosevear. Photography by Chelsie Walter. How did you first come to work at The Greenwich? I worked at Incredible Creations, a barber shop and a beauty salon down on Vine Street. One of the patrons, Kevin, was friends with Kenny. Kenny was his bartender at The Greenwich. I was giving Kevin a manicure one day and I just talked about my background, about bartending and he's like, “Oh I know someone that's looking for a bartender.” That's how I ended up here. I came in kind of casual, no résumé, and I thought I had it. When I showed up, I found out Mark [the owner] was a scientist. I was like, “Kevin! You didn’t tell me I was interviewing with a scientist!” He’s awesome, that’s why I’m still working here. I just love working with Mark and I admire him a lot. I started here right after the 2010 census. Wow, so almost a decade. What’s your favorite part about working at The Greenwich? The musicians and the live music. Getting to experience something that not many people can say they get to do. To be able to meet all kinds of wonderful people, and hear different sounds, and learn about jazz because I really wasn't into jazz initially. Just living vicariously through the bar. We close early, so I don't have to stay out until 2 a.m. Basically it's my job not to run anyone out of the bar. [Laughs] Most people have been coming here since before we were born. When this was a restaurant, the original Greek owners served dinner and lunch. They would have all of the neighborhood kids in and feed them meals. Now that they’ve passed, I think there's one son, Nick, and he works here. It’s just him and the community rallies around this place to keep it going. Do you know a lot about the history of the business? I just know that there is a wall of jazz greats, like I said, from before I was born. They also used to serve prime rib. This was a really fancy place where patrons came in dressed to the nines in fur coats. This was probably really popping back when they were calling Cincinnati the ‘Paris of the West’. The Greenwich is located really close to the river. People from all over came here. What would you say The Greenwich provides to the community? To me, it’s like the ‘Cheers’ of the community. There are a lot of new places popping up in the neighborhood and everybody is, of course, going to go and check those out because we want to frequent each other's businesses. But everybody always comes home. I’m glad we’re still around because a lot of places are fading fast. Kenny is awesome, and has been working here a long time. He is a jazz aficionado. He is from Dayton and when people come in from Dayton, he’ll know your auntie…your cousin. He’ll ask, ”What high school did you go to?” I think it’s things like that. It’s a family atmosphere. Use your words. Let people know how you feel. Be kind. Be considerate. And be beautiful. There’s a guy, George, and when he comes in, he’s my Norm. I shout out “George!” just like they would when Norm comes in on ‘Cheers.’ Everybody in the bar stops and looks and smiles. It’s that kind of feel. It’s a whole different rainbow of ages and races, and that’s another thing that I think is really awesome. How diverse it is. I lived in California and that was like really key in my life. I don't want to just be in one group. Do you see a lot of younger people coming in the door? It depends on the act. The younger crowd tends to come if one of the CCM professors is playing. We have a big band that performs here. Those are people that tend to be 25 years or older. The 25 to 35 year olds come for the R&B acts. The 35 and up crowd comes for the jazz, blues, and big bands. If you love jazz, some people come three times a week. They love the shows – plus Kenny makes a great Manhattan. What is your favorite drink here? I personally drink Jameson with a pickle back. [Laughs]. People love our mixed drinks – the daiquiris and Long Islands that come in a big fish bowl. It’s all about presentation. I try to make everything look nice. Tell me a little bit more about growing up in Cincinnati. Did you grow up in Walnut Hills? Actually, I did. I used to live right across from the library. That’s how I got to know a lot of people. I worked here and I worked at The Brew House simultaneously. Mark would have debates here, city council stuff going on. Walnut Hills Redevelopment Foundation would meet here. Everybody tries to do things at all of the local businesses. I meet a lot of people and take business cards. When I’m ready to open up my business, I’ll have investors. [Laughs]. It’s a whole different rainbow of ages and races, and that’s another thing that I think is really awesome. I was a nail tech at Incredible Creations. Quite honestly, I don’t have a college degree and I am kind of finicky. Basically, my mom gave me this book with all types of jobs to do. So I’ve been a nanny, a personal shopper, and a personal assistant. But I love nails. My goal is to have my own nail shop. I’ve been a bartender and a server for a long time, and then I do daycare during the day. I’ll take a quick nap. [Laughs] But it’s fun because I don’t have kids. I watch my cousin’s daughter. I’ve been watching her for about a year and a half. I got her when she was just a little over a year old, and she’s going to be three in February. She’s so smart and fun. I’m teaching her phonics at this point. She’s speaking full on sentences. She’s such a joy. I’m also doing some on-call stuff with my cousin’s company and then I come in here. I’m not married. I’m 45. I’m allergic to dogs and cats, or I would be the cat lady. You’ve experienced a lot in your lifetime. Is there any wisdom you want to impart on your cousin’s daughter as she’s growing up? I would tell her…use your words. Let people know how you feel. Be kind. Be considerate. And be beautiful. If I remember, I try and tell her this every day, so that she knows inside. She makes me be a better person. As a woman, I want her to grow up to be a strong woman, to know that she’s loved, and to be able to have the ability to love. A lot of people don’t even have the capacity. Maybe they didn’t experience it? Everybody’s version [of love] is different, but I want to give her the best version. I want to be the best that I can for her while her mom is at work. That’s really what I would tell anybody…just be the best you. Who has been an influential woman in your life? My mom, for sure. She’s like the goal setting queen. She gives me a new journal every six months, which helps. I have one that’s for free writing and goal setting. You need to meet my mom. Right now she’s reading People Can’t Drive You Crazy If You Don’t Give Them The Keys. We cook a lot together and spend a lot of time in the kitchen. Do you have some favorite foods that you cook together? I cook differently because of my allergies. I make really good greens, and I like making really good fish. I am the grill master around the house. For Christmas, we wanted to do something different, so we did crab, shrimp, sausage, corn, and potatoes. I did some salmon and, of course, we had to have some chitlins. My mom does a really awesome job making it, and you can’t really smell it. She’s like, “Here do you want to help me?” and I was like, “No, because I want to be able to eat them! I don’t want to help you clean them. I want to help you eat them.” But my mom is such a hard worker. It sounds like you’re pretty busy, do you have any time for any other passions or hobbies? My entire family moved to California. I came back and they stayed. Some of them got married and had kids. One of my brothers just came back, and the most important thing right now to me is my family. My brother’s an epileptic, my mom is an asthmatic, and I just want to dote on them. Take care of them and be there for them. Someone once told me, “You want to be a person that people adore.” That’s what I strive to be. I was waiting for you guys to arrive and this lady was like, “Ma’am, can you buy me a chicken wing?” and I was like, “Go ahead and order it.” I went and got her a chicken wing from the place across the street. It smelled good, too! It was just $1.50, but that good will still come back around. I want to nurture being a good person. Join us for classic cocktails and conversation at our February Boozy Hour! We’ll be hanging out from 7-9 p.m. Feb. 9 with the option to pop over for the SpokenWordSoul event in the adjacent room at 8 p.m. Cover for the SpokenWordSoul event is $10. We’ll be waiting with a pickle back just for you!